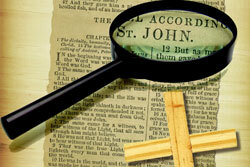 Is misinterpretation of the Bible really a big deal? Dave: To misinterpret scripture, is to misunderstand who God is. Jeff: Anytime heresy worms its way into the framework of Christian thought danger will follow. Throughout history people have taken wrong understanding of God’s word to great lengths. Dave: heresy has always provided a breeding ground for forms of religion without truly understanding the very God that religion seeks to worship. Jeff: Ultimately, the goal of interpreting the Bible is to understand what God is communicating to the human race. Dave: In any conversation, we must correctly understand what is being told to us. Jeff: If we mishear, or misinterpret, what was said the communication breaks down. Dave: Now imagine that the communication was about life or death matters! Jeff: If we fail to understand the truth of the Bible, we fail to know the truth about Heaven, Hell, and God himself. Dave: To know the truth we must put great effort into right doctrine, and avoiding heresy. ← Are we ALL atheists?